Scorpion stings often occur on a hand or a foot. They occur when a person disturbs a scorpion. Examples are stepping on one or reaching under a rock or pile of wood. Most scorpion stings cause mild symptoms such as redness and pain at the sting site. 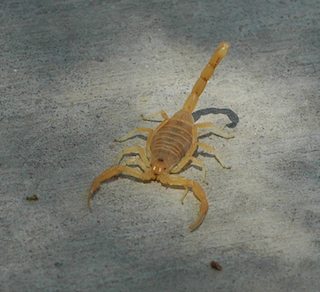 Stings from bark scorpions (found in the Southwest) can cause more serious symptoms. There are hundreds of different types of scorpions in the world. Scorpions look like tiny lobsters. They have a long tail with a stinger at the end. The tail curls up and over the scorpion's body. Scorpions are most active at night. They like dark and moist places. Bark scorpion. Found in the southwestern United States and Mexico. Mexican scorpion. Found in northern Mexico. Striped scorpion. Found in the southwestern United States and Mexico. The most common symptom is pain at the site of the sting. There may be numbness, tingling, redness and swelling around the sting mark. However, there can be pain without any visible sting mark. Symptoms usually get better in 24-48 hours. You should suspect a scorpion sting if you have symptoms of a sting and found a scorpion nearby. Most scorpion stings cause mild symptoms such as pain and tingling at the sting site. Cleansing: Wash the sting thoroughly with soap and water. Wrap a bag of ice in a towel to the sting (or a bag of frozen vegetables, like peas). Apply this cold pack to the area of the sting for 10-20 minutes every hour for the first 4 hours. Some pain for 1-2 days. It shouldn't be any worse than a bee sting. Numbness and tingling in the area of the sting may last for a couple days. Do not walk barefoot in the desert, especially at night. Check your shoes before you put them on. Shake out clothes, towels, and sleeping bags before using. Clear away any piles of wood, debris that are near the house. Reason: scorpions hide there. Fix holes and cracks in the walls of the house. Place the legs of a baby's crib in wide-mouthed glass jars (scorpions can't climb glass). Hire a pest control expert for repeated problems with scorpions.